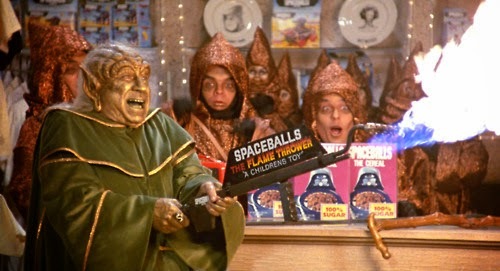 Several props from that Spaceballs "moichendizing" scene have turned up (e.g. the plates in the back), but the piece I really want is one of those boxes of Spaceballs The Cereal! I certainly hope we eventually get some sort of officially produced action figures down the line. Maybe one day MGM, current rights holder of Spaceballs (I think), will marry Disney in some business sense to make it feasible. For now, great showcase of the original props!